My promise to my friends and my mission in life is to help individuals, leaders, and communities improve our world through education, design, conservation, and media. My television and publishing work, social, and now streaming media are all dedicated to equipping families with earth-friendly solutions to support their everyday lives. In the center of the country, just outside Little Rock, I open my home to share my design, gardening, preservation and eco-friendly building practices for all to experience. My garden and landscape design practice help families and organizations create places that embrace the gifts of nature. My latest venture is creating communities around the country that respect the earth, improve our health, and are beautiful to live, work and thrive within – for all age groups and persons. I welcome you to join me in supporting the cause of making our planet a more diverse, friendlier, healthier and more inspiring place. To learn more about Allen’s background, click here. Investment in one’s community is critical to building a better world. It is a pleasure and honor to be able to offer the gifts shared with me to friends near and far. I hope to see you at Moss Mountain Farm soon or one of the many wonderful events I will be attending across the country this year. Creating dynamic outdoor spaces that inspire, increase our health, and preserve the natural environment has always been core to my garden and landscape design ethos, my material selection and installation process. Selectively I am partnering with developers, builders, designers, craftsmen and women, philanthropists and socially conscious investors. My goal is to extend the health, well being and preservation benefits of Moss Mountain Farm to our friends across the Country. To learn more about Allen’s design practice click here or see his design firm’s website. Sharing is very important to me. I have benefited immeasurably from the teachers, mentors, family members and close friends who have assisted me, and who continue to help me with my life’s work. Because of the platforms afforded to me, I am in a unique position to share my knowledge and my love of gardening. The books I have written are the result of my passion to provide deep, practical insights on design, gardening and horticulture. And, as gardening can be great exercise, from which one develops great appetites, I have also included my family book of recipes, Seasonal Recipes from the Garden. I hope you will enjoy learning as much as I enjoy sharing what has been gifted to me. 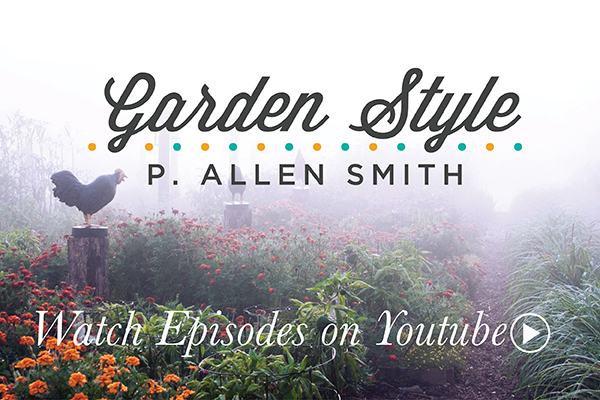 Follow Allen’s appearances or join him for an inspired presentation on garden design, preservation, horticulture, and happenings from his Moss Mountain Farm. And please see our Tours Page for Allen’s appearances at Moss Mountain Farm. Check back often, this section is updated throughout the year. March 26th Houston, TX: FLOWER Magazine, Design in Bloom For behind-the-scenes of this event, see: here. April 4th St. Louis, MO: The Order of St. John + P. Allen Smith For behind-the-scenes of this Event, see: here. April 5th Atlanta, GA: P. Allen Smith at Georgia Tech For behind-the-scenes of this appearance, see: here. P. Allen Smith presents to a crowd of 5,000 at a recent garden event. Each day as I walk through my garden, feed my chickens, and engage with the creatives with whom I work, I am filled with inspiration. Writing is a tremendous outlet and expression for my daily inspiration. And while I cannot write every day, I hope you will enjoy the following short pieces, which focus on topics I have found meaningful and of keen interest.